This month, the annual celebration for International Women’s Day came with a new campaign theme, “Balance for Better.” That message was in full voice last week at NJIT, as more than 200 young girls from New Jersey’s schools visited campus to learn about and showcase their abilities in all-things science, technology, engineering, arts and math (STEAM) for national Pi Day. The Pi Day celebration — recognized March 14 in honor of the mathematical constant, Π (pi), or 3.14 — marked the annual signature event of the National Science Foundation (NSF)-funded Leadership and iSTEAM for Females in Elementary School (LiFE), a program dedicated to increasing the number of young women interested in and represented in science, technology, engineering and math (STEM) careers. The event was also one of more than 200 events scheduled to be held across the state in March as part of New Jersey STEM Month. Throughout the day, third- to sixth-graders from the Hillside, Long Branch, Morris Plains and Weehawken School Districts met with representatives from Apple, the U.S. Army, NJIT female faculty and students from Albert Dorman Honors College to learn about careers in research and other STEAM-related topics. Students also participated in interactive activities and experiments, and presented work they have done as part of their schools’ LiFE STEAM clubs throughout the year — ranging from designs for safer fire escape ladders to high-performance athletic clothing. During the event in NJIT’s Campus Center, students collaborated with NJIT faculty, conducting “rocket experiments” to learn about chemical reactions alongside professors such as Miriam Gulotta and Bhavani Balasubramanian, from NJIT’s Department of Chemistry and Environmental Science. Other students teamed up with Louis Wells from NJIT’s Theater Arts and Technology program to work on expression and communication skills, as well as Camelia Prodan of NJIT’s Department of Physics, who helped students experiment and visualize how waves propagate through materials using a system of magnetically coupled fidget spinners. According to principal investigator of LiFE at NJIT, Bruce Bukiet, educational events, such as Pi Day, can foster early interest in STEAM, and ultimately, inspire more girls to pursue careers in fields where women remain an underrepresented segment of the workforce, such as engineering, physical science and computer science occupations. 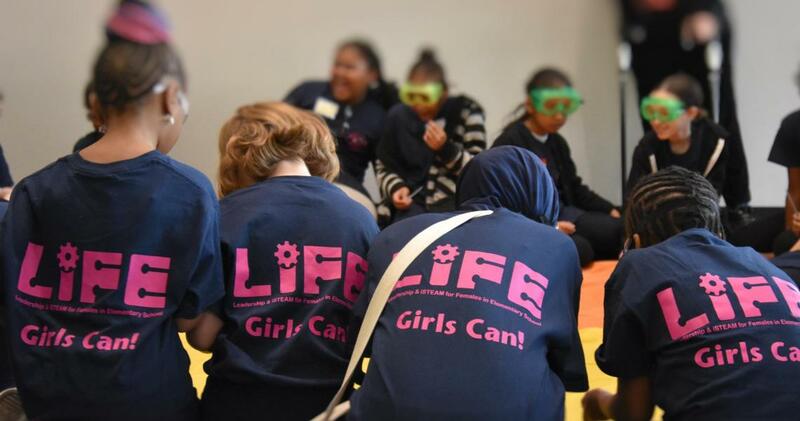 “With the support of female role models who are established in STEAM careers, these kinds of exciting events can instill important leadership, communication and technical skills early on, and help lead more girls to persevere and excel in STEAM disciplines years from now,” said Bukiet. In 2019, NSF is set to invest $30 million in each of its Big Ideas to “continue to identify and support emerging opportunities for U.S. leadership in Big Ideas that serve the nation's future.” Bukiet and LiFE co-principal investigators, Nancy Steffen-Fluhr and James Lipuma, say that NJIT’s program will use its portion of funding this year to continue providing supplies and professional development training for New Jersey teachers running girls STEAM clubs. It will also continue coordinating LiFE events at NJIT and off campus over the remaining year of the project, including an upcoming visit to the Liberty Science Center.